What are the different type's of leather Hestra uses and how are they different? Leather is a natural, living material. It is a by-product of the meat industry and one of our oldest materials for clothing. It is beautiful, supple and provides a comfortable fit. Some leathers withstand moisture well, while others are softer. The characteristics of leather are partly a result of where the animal lived. Hestra select’s their leather with great care and work closely with the tanneries. Since they have been working with leather since 1936, they have got a good network of quality-conscious suppliers. Many of their gloves are made of leather without dyes. For our coloured gloves, we only use drum dyed leather. This requires a better quality raw material than when dying the surface but means that the leather retains its natural appearance and characteristics. Depending on the intended purpose of the gloves, they choose nappa, suede or split. Elk split leather is porous and insulating and they use it to make our Loke outdoor gloves that are perfect to wear around the campfire. Nappa is more moisture resistant and is therefore used for most of their ski gloves. Army Leather is their most durable leather, originally used to make gloves for military purposes. It is a specially treated goatskin that withstands tough, outdoor conditions. The leather has good impregnation and its structural properties provide effective protection against moisture. Cowhide is a durable leather with good impregnation properties. It takes on beautiful nuances in colour when dyed and resists moisture and abrasion well. It is therefore widely used for many of our ski gloves. Nubuck is a leather where the surface – the shiny and smooth side – is polished giving it a suede-like feeling. Peccary is wild boar leather from South America. It is soft, smooth, warm and considered to be one of the most exclusive leathers for gloves. Elk Leather is a soft, rich leather with good insulating properties and a fine texture surface. Although it’s durable leather, it has a slightly sensitive surface. They use elk leather from Sweden and Finland, where the climate produces the best quality hides. Drum dyed leather is colored all the way through, allowing the leather to retain its natural characteristics. This method requires higher quality raw materials than when the leather is only surface-dyed. Ecocuir© is a trademark-protected cowhide that is tanned without the use of chrome or synthetic dyes. The leather is saturated with grease to better repel moisture. It’s beautiful natural colour develops a lovely patina over time as the gloves are used. Wild boar leather is a robust leather that is both tear and abrasion resistant. It has a porous structure that insulates well. 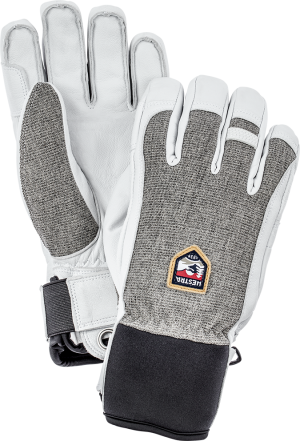 They use Swedish wild boar leather for their Loke outdoor glove. Thanks for the leather and dye explanation! I have been wearing a yellow pair of Hestra for about 8 years now and have been totally impressed with the colour retention. I bet they were barrel dyed as you have suggested.